Red lipped. An unexpectedly glamorous epithet for a small playful looking orchid. 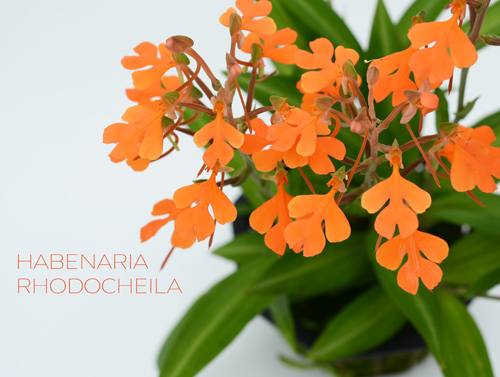 And although rhodocheila means red lipped, there are actually many color forms of Habenaria rhodocheila, including orange, yellow and various shades of pink and red. I find this plant irresistible, whatever the lip color. And it's not hard to grow. Here's what you need to know. Habenarias are perennial plants that grow from tubers. There are hundreds of species; some grow in temperate climates, others in tropical climates. 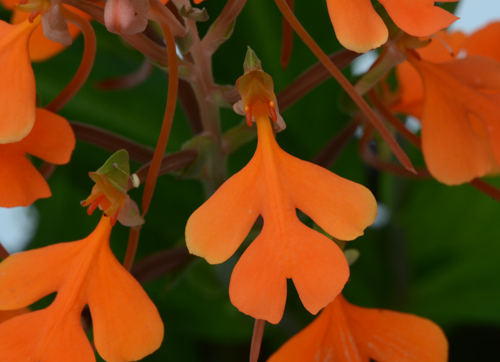 Habenaria rhodocheila is one of the tropical species from southeast Asia. It grows in areas that have a dry season. In order to cultivate it successfully, you have to accommodate its annual growth cycle. ANNUAL GROWTH CYCLE Habenaria rhodocheila produces a new shoot in late spring and flowers in late summer. After flowering, its leaves continue to photosynthesize for a few months while the plant stores carbohydrates and starch in the underground tuber. In late fall the foliage shrivels, leaving only the underground tuber to sustain the plant while dormant. Water: The appearance of the new leafy shoot is your cue to gradually increase the frequency of watering as the leaves expand and the root system grows. In spring the potting medium dries out slowly, mostly from surface evaporation. Until the leaves expand, the plant doesn't have enough leaf surface area to lose water via transpiration; so it's not taking up much water from the medium. Let the medium become almost completely dry, then water deeply. Light: 80% shade. 800-1500 footcandles. Eastern exposure shaded from strong sun. Temperature: 58º F (night minimum); 80º F (day maximum). Water: By the time the plant has its full complement of leaves, the medium should be saturated regularly, when the upper 1" is barely moist. In our greenhouse, where the plants receive continuous strong air flow from a circulation fan, this is about twice a week. Under other conditions, it may be less frequently. Fertilizer: Once the plant has some fully expanded leaves, apply a balanced (roughly equal percentages of nitrogen, potassium and phosphorus) fertilizer at half strength every two weeks. Water: Don't be alarmed in fall when the leaves start to turn brown. This is your cue to gradually decrease the frequency of watering. Allow the plant to dry out before watering. Allow the leaves to remain on the plant until they have withered completely. Water: By mid winter the plant should have no leaves at all. Water deeply, but only as often as is necessary to keep the tuber from shriveling. Allow the soil to become bone dry, but don't let it stay that way for more than a few days. In spring, before the onset of new growth, remove the tuber from the pot, cut away the dead roots, and repot in a 4" pot with plenty of drainage holes. Soil-less media for tropical terrestrial orchids typically contains some combination of fine grade fir bark, charcoal, perlite and sphagnum moss. 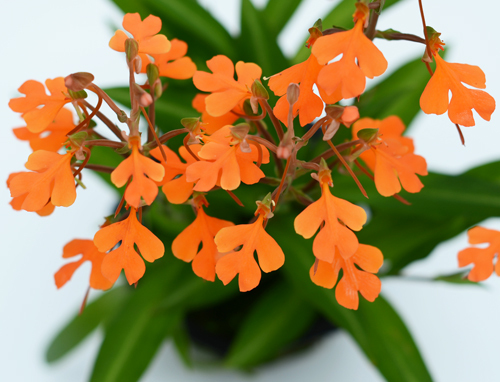 Habenaria rhodocheila is so rewarding and, actually, less work than an evergreen tropical orchid. Most of the work involves learning its growth cycle. How hard is that? Want to know where to get one? Tropical Orchid Farm is a good place to start.